Fresh off our mother's day festivities, me, Kaila, and Rebecca went for a walk at a park in our neighbourhood. We tried to soak up as much of the sun as possible before those gray clouds rolled in. 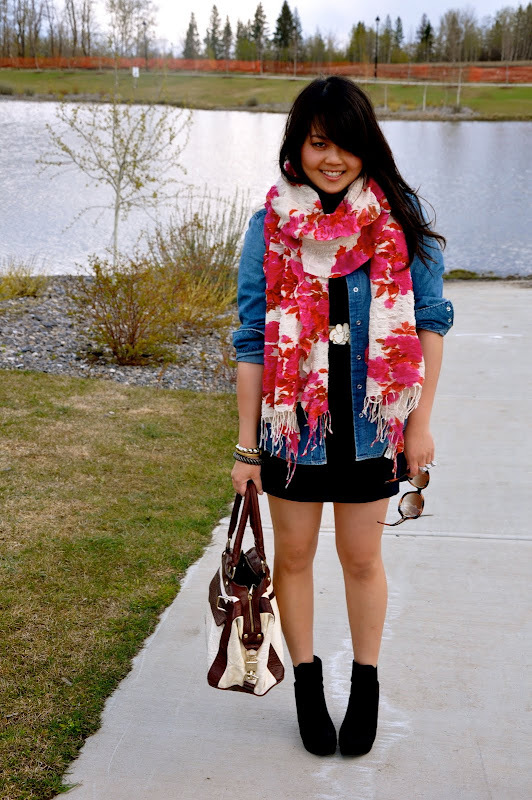 On Jasmine: Blue Denim Wash Linen Blazer, Zara. Black Shirt, Calvin Klein. Ruffled Skirt, Zara. Belt, For Love XXI. Oxford Wedges, Zara. Hangbag, Yves Saint Laurent. On Rebecca: Floral Dress, Purr. Gladiator Heels, Zara. Chain Handbag, Zara. On Kaila: Denim Chambray Shirt, Gap. Dress, Wilfred. Flower Belt, Vintage. Floral Printed Scarf, Anthropologie. Railroad Spike Bracelet and Bangle, Giles & Brother. Hand-made Studded Bracelet. Handbag, Rebecca Minkoff. I love you guy's style and your blog. It's so cute!